When you hear the term 'gamer' these days it's safe to assume that it refers to a person that regularly plays video games. 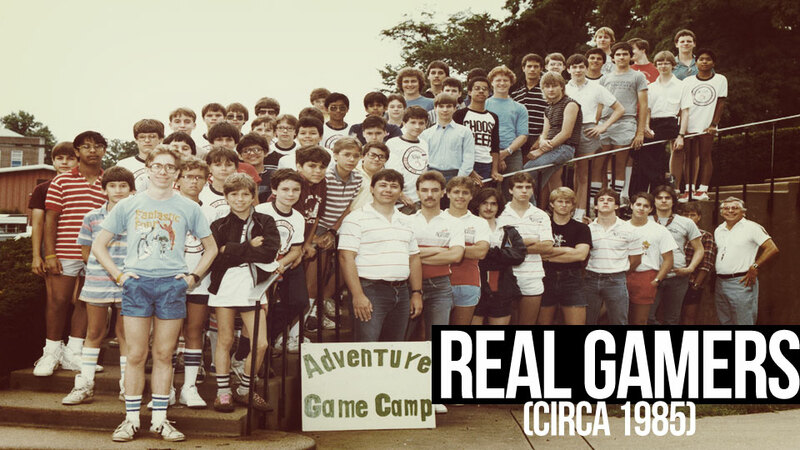 Way back in 1985, however, "real gamers" carried leather dice bags, sat around paper-cluttered tables for hours on end and rarely possessed a pair of X chromosomes to rub together. At least that's the impression I get from the ancient humour text file "What Real Gamers Do and Don't Do", written by a fellow named Fritz Mertens way back in March of 1985, after the video game crash of the early 80's and months before the North American release of the Nintendo Entertainment system. Things were different back then. Men were men, women were not generally present, and the gaming machine of choice had a piece of fruit on front of it. Fritz starts off with a look at the games a "real gamer" plays, i.e. Advanced Dungeons & Dragons and not much else. Corollary: Real gamers don't play Tunnels and Trolls. Real gamers think AD&D could be better, but play it anyway. That last one still rings true today. Not one person has been truly satisfied with Dungeons & Dragons in the history of the game. Real gamers know that AD&D module "T2" will never come out. Corollary: Real gamers think "T1" sucked big time. Modules T1 through T4 became the Temple of Elemental Evil, largely considered one of the greatest role-playing adventures of all time, which eventually got its own computer game. Real gamers don't have characters over 18th level, as they don't cheat. Real gamers never play "exactly by the book." Real gamers own all the AD&D books with the "old covers"
Corollary: Real gamers don't own a copy of the Fiend Folio. Real gamers have plastic sheets on their characters. Corollary: Real gamers never laminate their character sheets. I have a box filled with laminated character sheets somewhere. I am so ashamed. Then Fritz goes into some territory that today's gamers only breach under the comforting blanket of internet anonymity. Real male gamers don't play female characters. Real female gamers aren't female gamers, just girlfriends of male gamers. Corollary: Real female gamers weigh over 200 lbs. Now that's just not fair. I've known plenty of attractive female AD&D players in my time. Then again, in 1985 I was 13 years old, and at that point every female was incredibly attractive, as were many inanimate objects. Perhaps there's a certain truth to the corollary as well, but then most male gamers were over 200 pounds as well. It was a gaming thing. Real gamers know Gary Gygax is a jerk. Gary Gygax, co-creator of Dungeons & Dragons, was a great man who fired the imaginations of an entire generation. Next Fritz takes a look at the most important tool in the 1985 gamer's arsenal. Real gamers never buy d30's. Real gamers don't buy plain dice. Addition: Real gamers NEVER buy Basic Set dice or Dragon Dice. Real gamers own at least 10d6 for that handy Fireball. Real gamers don't buy d6's larger than 5/8". Exception: Unless they use them for Privateer or as a Cow miniature. Real gamers buy d6's with dots and not with crummy numbers unless in a set. Addition: d6's with numbers always roll low. Real gamers don't buy round d6s. Real gamers buy d20's with all 20 numbers, not with 0-9 twice. Real gamers bring all their dice to every game. Addition: Real gamers don't show off their dice. Real gamers always buy dice whether they need them or not. By the year 1994 I had amassed a collection of thousands of multi-colored plastic dice. I had a few loaded ones, but it was so ridiculously obvious they were loaded they were only brought out when my group needed a laugh. Besides, when I was Dungeon Master I just made up the numbers and made rolling sounds behind the screen. All DMs do this. Now Fritz takes us on a whirlwind tour of gaming conventions from two-and-a-half decades ago. Real gamers go to conventions. Corollary: Real gamers never go to comic conventions. Real gamers run a game at a con so they can get in free. Or they work security. Hi, Dragon*Con! Addition: Real gamers pre-reg if they can't run a game. Real gamers attend Pacificon, Dundracon and Gamescaucass. 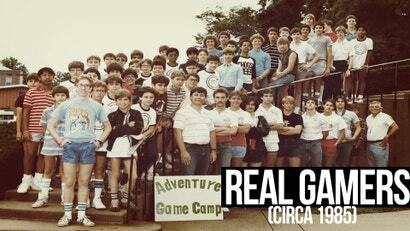 Corollary: Real gamers never went to Chaoticon, Augacon or Marchcon. Addition: Real gamers used to attend Grimcon. Addition to the addition: Real gamers want to go to Gen Con. Corollary to the second addition: Real gamers never go to Gen Con. I've been to one Gen Con. It was held in Atlanta years ago, and I won a copy of Wizardry: Crusaders of the Dark Savant in the dealer's room during a rebel yell competition. Note: I am from Pennsylvania. Real gamers never play in AD&D/Arduin variant runs. Real gamers always get a hotel room. Addition: Real gamers NEVER commute to the con. Real gamers never play in games with "80%+ kill rate". Real gamers don't pay the absurd prices the hotel charges at the "snack bar". Real gamers only watch "Zulu" and "Zulu Dawn" in the movie room. Corollary: Real gamers don't watch "The Dark Crystal". Hey now, I love The Dark Crystal, jerk. Real gamers get less than 5 hours of sleep a night. Corollary: Real gamers get less than 5 hours of sleep total. Addition to the corollary: Real gamers don't get any sleep at all. Remember No-Doz? Those magical pills that kept you awake for 72 hours straight? I don't remember them either. Finally, we'll skip ahead in the Misc section of Fritz's epic post to the final four notations, for dramatic effect. Addition: Real gamers own Apples. Addition to the addition: Real gamers own modems. Addition to the addition to the addition: Real gamers own Apple-Cats. Hehe. 'Real gamers' and why making that distinction is even important seems to be something everyone has to go through. People who actually love games don't give a sh*t about what they play games on, 'gamers' it seems haven't changed! Tunnels and Trolls is actually a far superior system to ADnD. TnT is the Ron Paul of the rpg world. Superior in every way, but unloved.